Delicious and nutritious beef recipes for the winter months. As the nights get colder we start to crave warm, hearty dishes. Yet while carb-heavy meals may seem like the answer, our bodies and minds actually hunger for nutritious foods. To help Aussies get through the colder months, Australian Beef has teamed up with dietician and nutritionist Jaime Chambers to create quick and tasty mood-boosting recipes. Jaime said, "Comfort food doesn't need to be unhealthy. Tasty soups, warm salads and fresh stir-fries are the perfect way to fuel your body with proteins and vegetables needed for the colder months, while keeping you satisfied and full." "The great thing about proteins like beef is that it's not only delicious but packed full of essential nutrients like iron and zinc, which help you feel happy, motivated and energised." 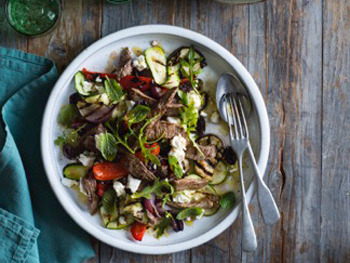 Beef is an excellent source of iron and paired with fresh grilled vegetables, this super salad will help boost energy levels. To make the dressing, whisk together ingredients in a small bowl with sea salt and black pepper. Heat a BBQ, grill or fry pan to medium high heat. Spray the vegetables with olive oil and season with salt and pepper. Pan fry in batches until golden and tender. Once cooked, set aside on a plate to cool. To cook the beef strips, season with a pinch of salt and pepper. Heat oil in a large non-stick frying pan or BBQ over high heat. Add the beef in two or three batches to ensure the pan stays at a high heat and fries the beef. This should only take around 2 minutes per batch. Place the beef on a warm plate once cooked. To serve, use a large platter and cover the base with a bed of rocket. Scatter over the char-grilled vegetables and beef strips, and then drizzle over the dressing. Finish with the torn olives, a scatter of crumbled feta and mint leaves. Rump steak takes a total of 5 minutes to cook and 5 minutes to rest for a juicy medium steak. 1. Heat a BBQ, griddle pan or fry pan to high heat (don't add oil). 2. Rub your steak all over with olive oil and season both sides with salt and pepper. 3. Cook one side of the steak for 2 minutes without moving it. 4. Cook the other side for 2 minutes for medium – longer for well cooked. 5. Rest on a warm plate for 5 minutes before serving.